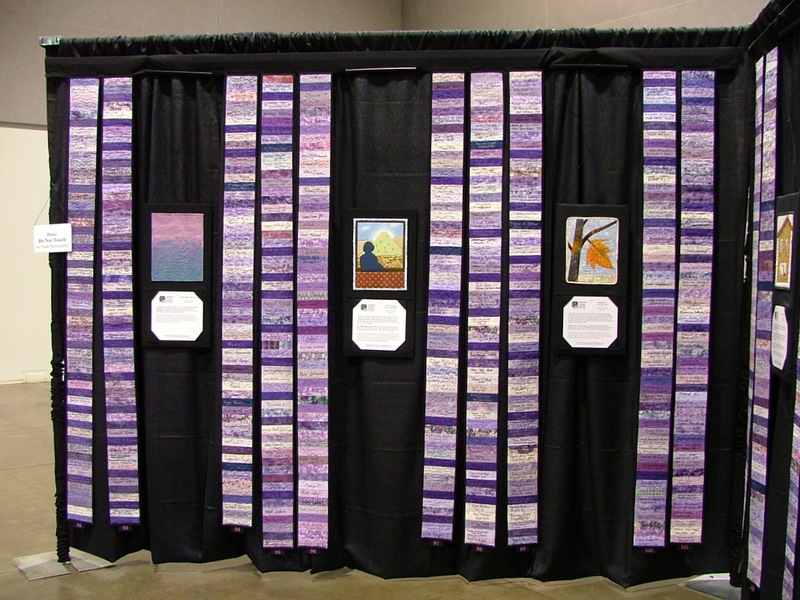 AIH2H as I like to personally call it, continued its five-year journey across the United States with a stop at Portland, Oregon's NW Quilting Expo. 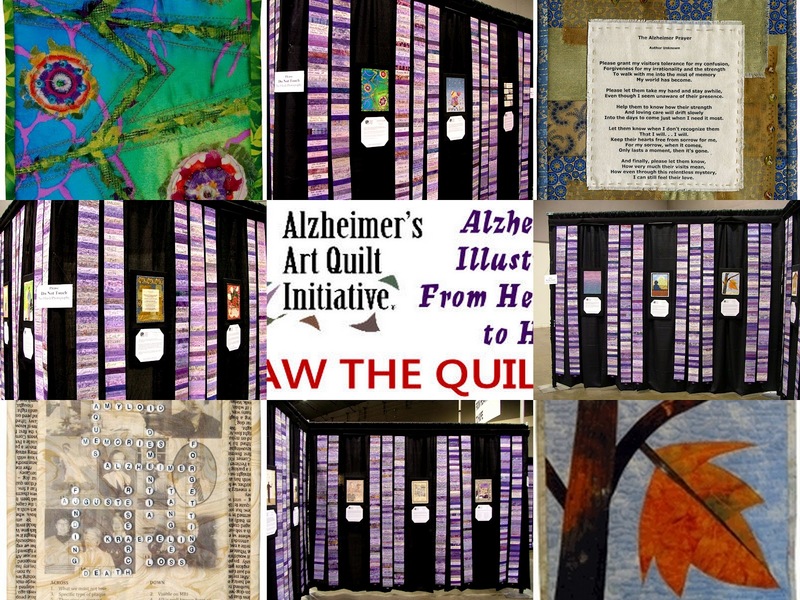 This amazing traveling exhibit is a series of black walls, creating a walking maze, which consists of fifty-four small format art quilts (9" x 12") which all illustrate in a variety of ways and thematic emphasis, the impact that Alzhimer's Disease has had on the artists who created them. 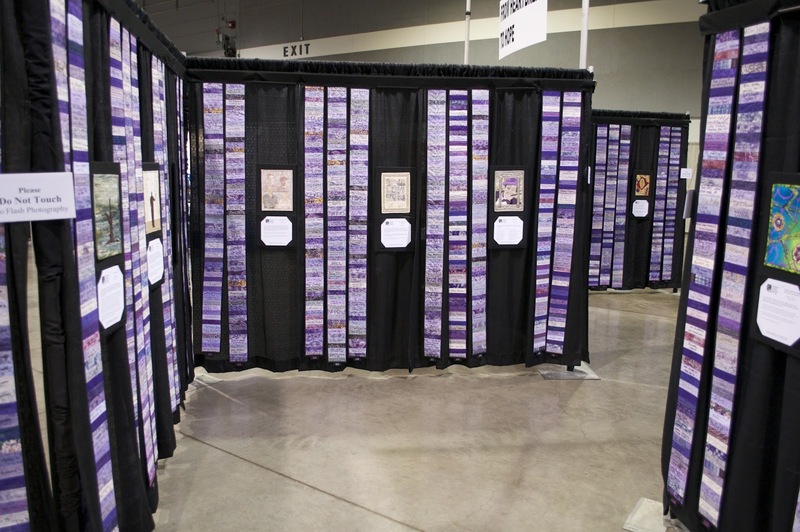 These small art quilts are hanging among 182 "Name Quilts," each 6 inches wide and 7 feet tall, which carry the names of more than 10,000 individuals who have/had Alzheimer's or a related dementia. The names of these loved ones, written on fabric patches by family members and friends, honor the 5.4 million Americans in the United States struggling with Alzheimer's disease. 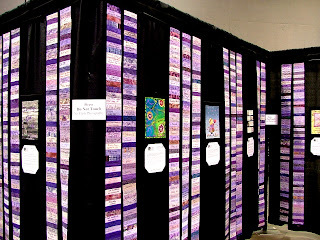 As a volunteer for AAQI, with **13 family member names among the "Name Quilts" and two of my own small format art quilts among the 54 art quilts, I felt so personally connected to both this cause, and to this exhibit. 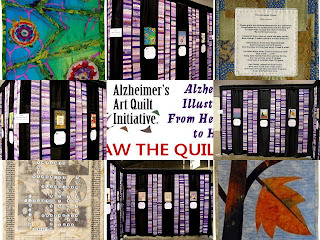 Perhaps, that opinion is based on my having two of my own little small format art quilts on display, and the pride that I felt also viewing the two quilts from the members of my AAQI Liberated Quilting Challenge group, as well as the overall pride I feel from ALL of the quilts that my challenge group members have created and donated to this amazing cause! 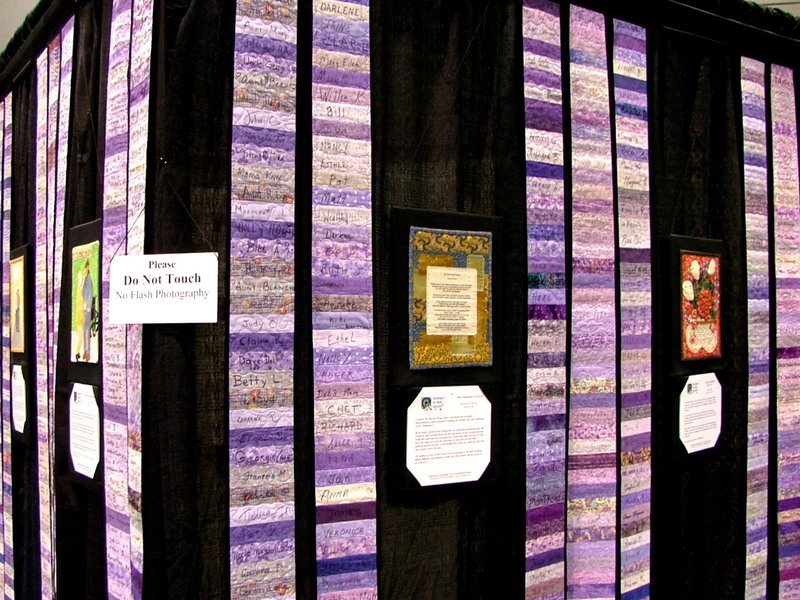 There is a depth, and a breadth, and a far reaching scope, to this exhibit that simply surpasses making beautiful quilts in an artistic fashion for any other kind of art challenge. So, no matter how creative the other challenge exhibits might have been there..and I visited each and every single one...and loved them....still, there was no comparison for viewing, and feeling, the hearts and the souls of true art quilters who create for a genuine cause of true purpose. There is simply no comparison! As I wandered through the maze shaped exhibit, I found myself both slowing down to truly feel the raw emotions the quilts evoked, and then speeding up to not have to feel them so painfully and personally, each and every step of the way. You have to allow yourself to feel, but keep from going into the sheer tragedy of this disease and what it has done to your loved ones, yourself, and the dynamics of the entire family. And trust me, this is something that cannot be explained, but only felt through the tears, and the ripped out and torn seams of the inner heart. My first 'go through' was a quick one. We were early, and there were few visitors as I headed to this exhibit first. But the lovely and gracious docent, Sue, who was just plain 'great Scot' awesome at what she does, and the magic she contributed there, immediately connected with us, listened with an open heart to my own story, and before long, there was a group gathered around me... to 'over hear' and 'over heart' my story. As I looked at the faces of those viewing all of the quilts, one by one, I knew that each, and every person there had their own story... and my own heart opened to bursting.... so that I had to pull back just a bit, in order to do what I had to do... and both feel, yet document this exhibit for all eternity within my own spirit. 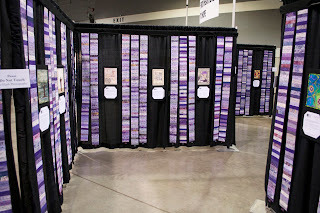 But here, at Expo, in this exhibit, I wanted....and needed....to chronicle the journey through this exhibit. 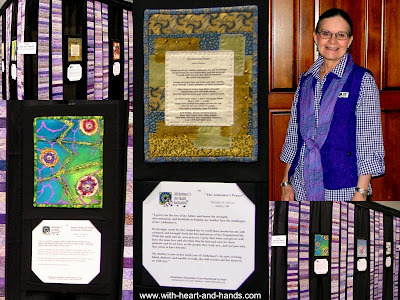 But I could not help but mention that as I personally realized...somehow, for the very first time, I realized.....that my own two quilts in this exhibit were begun in May of 2010.....and that I had sewn them with a broken, and still healing from surgery, wrist. I had just spent months in Douglas (Island) Alaska, caring for my mother (then in her 6th year of advanced Alzheimer's) and my father (who had two silent heart attacks during this period and was beginning vascular dementia) and myself, who slipped on the worst black ice in Juneau-Douglas's history, and not only broken my wrist in three places...but slammed three wrist bones into my forearm. I had immediate surgery, the implantation of a titanium plate and 10 screws, and I just kept on going. Because, that is what Alzheimer's Disease forces us to do. It takes so very much away from us, and all we can do is cope with its ravages, day by day, bit by bit, until it all becomes a painful blur and we almost forget how incredibly challenging it is. There is not even time to feel sorry for yourself when all the focus must be on those you are helping and the horrors that happen amidst family members through all of the stage of denial, and grief....to acceptance. I had cared from my parents for several months, cooking, cleaning, giving shots and pills, and doing laundry with just one hand and a bit of the other arm's elbow...before I returned home to Oregon in mid-March and other family members came in to take over. "How could I possibly sew anything? I only have one good hand and wrist?" But then I realized how truly ridiculous that was! I had already worked every minute of every single day with that one hand and one arm, doing things that others wouldn't even have thought of trying. And now, at least, I was out of the stiff velcro'ed 'cast' since surgery and I was supposed to use this hand as much as I could to get it to working again. 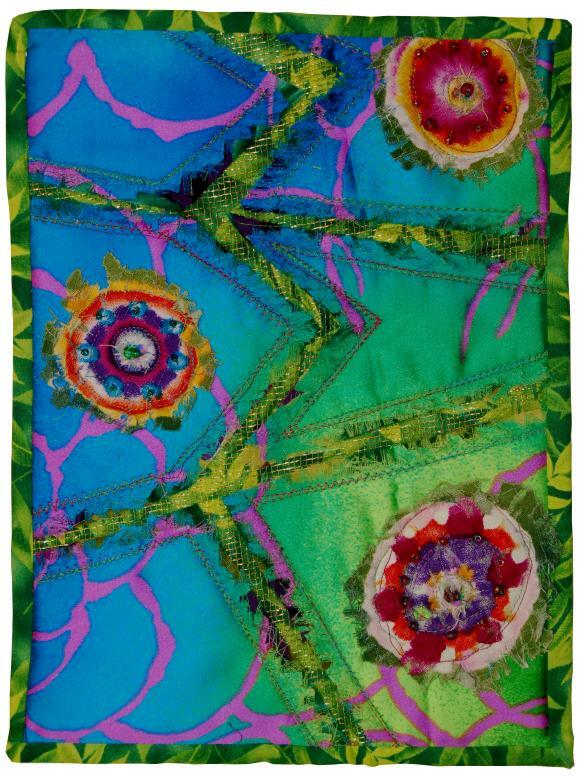 My AAQI quilts were the result of that therapy. From mid March to December, I made and donated 10 quilts and these were among those 10. That they had been made 'then' and with my wrist, hands, and actually the entire arm in this state...was an aha moment for me during this exhibit. How could I possibly have not realized this before? That is how the mind focuses on surviving and doing, and not running and trying to escape the horrors of all it all. And by that I mean my mom and the Alzheimer's Disease, and my dad preparing for his death in mid-August. I needed to be present for them, as I do now, for my brother and my sister-in-law and their challenges, so I just simply do what I need to do and don't focus on how hard it all is! What this has all taught me..the doing, the being, and now the finally, really, really 'seeing' was huge for me. Not only was I not alone on this winding maze of a path, but I was a survivor who was making it to the end of its journey.....one way or another. But I was making it. So, whether I am in Alaska, helping my family, or in Oregon helping my family, or now, in Oregon helping my Alaskan family....I'm still somehow doing it. And right now in Oregon, I am the only one helping them in many ways, as it has proved too hard for everyone else to find the time, much less deal with the constant emotional drain. I hate driving on 8 lane freeways, I hate getting lost over and over in big cities as I try to bring my SIL to visit my brother in his fourth month of hospitalization. It is hard visiting my almost 97 year old mother-in-law for two hours a day for the past 8 months..especially now when she has been admitted to hospice. But I just do it! It is just another challenging maze of discovery, just another series of art quilts in the making in my own life's journey! As I looked at this Hearbreak to Hope display, than awareness made me feel so strong, so proud, and so capable. I had made them..these two little art quilts..during one of the singlest, hardest, most painful, years of my life....and I had done it with one strong hand.....and one healing hand. This maze, this walking through the journey of awareness, has dark walls, but there were so many spots of bright color, of clarity, of awareness, understandings, and sometimes even of joy. We all see and face many, many walls...but some hold up symbols of our progress and our strengths, as well. .....and oh, yes...some chairs to sit down and have a rest. And then...there are more quilts to make, more hearts to touch, and let's face it...more money to raise for Alzheimer's research! There IS hope! 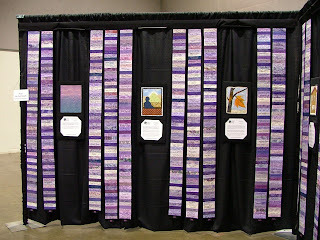 My AAQI small format art quilts that are included in this exhibit. 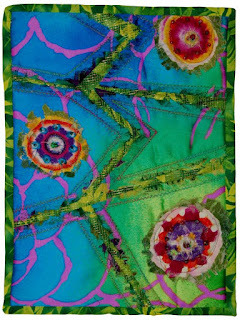 Artist's Statement: Like my mother's memory, this art quilt consists of many layers, tangles, and threads...with spots of clarity and light hidden amidst the colorful (but often chaotic) surface layer. Dedication: For my mother who continually pushes through the advancing layers and tangles of Alzheimer's with infinite grace and humor. Artist Statement: I grieve for the loss of my father, and honor his strength, determination, and fortitude in helping my mother face the challenges of her Alzheimer's. He lovingly cared for her, helped her to retell those memories she still retained, and brought forth the bits and pieces of her fragmented life. With this quilt and my own prayers, I pray that other care givers will have the same love and devotion that he had and care for their patients and loved ones, as the people they truly are...and not just who they seem to have become. Dedication: In honor and memory of my father, a loving care giver, and with the deepest love for my mother who is now in her fifth year of Alzheimer's. In spite of being blind, diabetic, and unable to walk, she still reaches out her heart to us with love. Fabulous post about the emotional journey of viewing an AAQI exhibit. Raw and real, humbling and uplifting, sobering and powerful -- and truly engaging (for those who have experience with AD as well as those who need to learn what they don't want to know). I am SO glad you had the chance to visit the exhibit and discover more about yourself. You never cease to amaze and inspire me. Thank you for sharing this entire experience with us. It gives me pause to think about how I cope and how I should be doing. I think now, that maybe I can do a bit more. Thank you. Oh Michele, another beautiful and moving post. You amaze me and inspire me. You're right about not being alone; there are others who have walked a similar walk, there are those who care about you - whether they know you personally or online, and above all, there is a loving and gracious God who never gives us more than He knows we can handle -- even if it's way more than we think we can! Oh, wow! Michele, you've moved me to tears....again. What a blessing to read your experience seeing the show. Thank you...sending you a warm hug. Michele, you are an AAQI Rock Star! Thank you so much for all you have done for us. Your heartfelt words here clarify our purpose in reaching out to the public to raise awareness. You remind us why we do what we do. Michele, as others have said, you are an inspiration to us all. You have done so much to help promote AAQI through your own personal journey with this disease and never once have I heard even a whisper of a complaint. You have borne more than most, and yet you keep on keepin' on. Your story has to touch anyone who hears it. Know that we are all out here fighting to beat this thing, standing side by side even though we are separated by many, many miles. Sending you hugs! 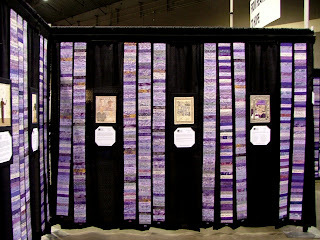 What an amazing post and more amazing exhibit that really touched my heart. Very moving to read about. It is amazing how you are able to write about everything and we can almost see through your eyes. You are so talented. Love your blog so much. So touching everytime I come here and read about your family, your quilting and this cause. God's many blessings to you for all you do for so many. Amazing and beautifully written. You made me cry. This touched me so much! Thank you for the work you put into this cause and your parents. As a newly-diagnosed early-onset dementia patient I was looking for pictures of Sunbonnet Sue with chickens (because I have four pet chickens) when I found your website. Truthful Loving Kindness (Yes it is my legal name) & "Blessing" the wheelchair Service Dog, along with "Snuggles", "Jazz", "Onyx", and "Purl".